Bod's blog. Obviously. 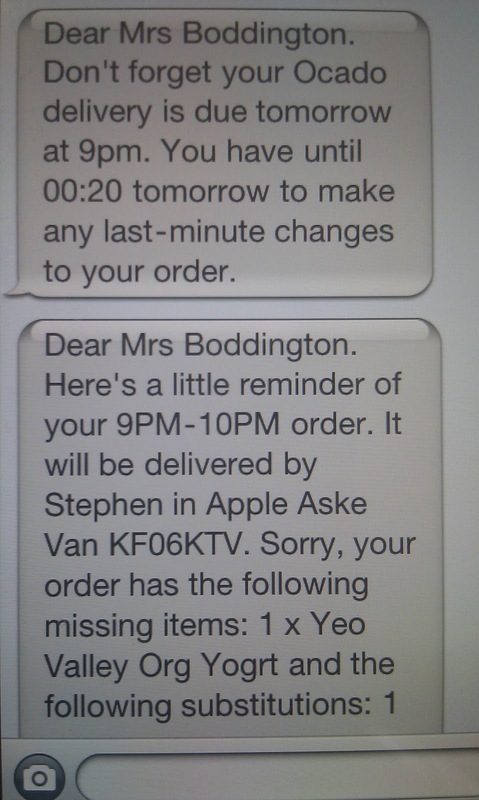 : Why aren't more companies using SMS notifications? Why aren't more companies using SMS notifications? My wife is what I would regard as a digital housewife. She is an eBay veteran (on more than one occasion I have asked where something is only to find that it was sold a month ago) and does a large proportion of her shopping online. She also has an iPhone and when not sat on the sofa with the laptop on her lap, she uses any one of the number of apps she's got to shop or browse retailer apps. With two kids, she's on the go most of the time so this fits nicely with her lifestyle. Which helps to explain why I am so impressed with what is, on the face of it a really simple thing - the Ocado SMS notifications. So... we've got a food delivery on order and the day before, she gets an SMS reminder her that the delivery is due the next day and confirms the deadline to change it (so the reminder can act as a prompt if you now need more goods). 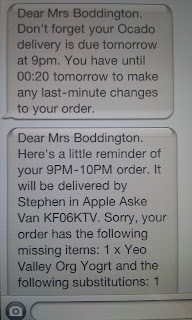 Then on the day of delivery, another SMS that includes the 1hr time slot; the name of the delivery driver; the type (i.e. livery) and registration plate of the delivery van; and details of any missing items. So with a couple of simple text messages, including some relevant information, it makes an online and remote transaction into a more comfortable, reassuring and personal process. Ocado aren't the only guys that do this - my wife has had similar notifications from Sainsbury's and the Home Delivery Network. And one of my local taxi firms also does the same thing - I called to order a cab and then received one message straight away to confirm the booking and then another a bit later to tell me the car was a couple of minutes away; that would pick me up; and the name of the driver. Great if you're a single female. It is such an easy thing - there are any number of Mobile Technology providers that offer these kind of capabilities, and of course the more retail moves digital (note that I don't say "online" as mobile retail is growing too) and the more suppliers doing this, the more comoditised and cheaper it will become. And as I mention above, a simple SMS like this (bear in mind that as a more personal channel than email, SMS can provide a more emotive reaction), can provide both a differentiation in terms of service and build a degree of consumer interaction and brand affiliation than would otherwise not be possible. Little actions can go long long ways to providing great service...and this shows that the best killer app out there is sms. Is MMS neglected by mobile marketers?